Warning-picture heavy post. This is my kitchen hutch. It sits in my breakfast area, I bought it at the thrift store for about $70 about 5 years ago. I knew it had good bones and with a little love I could bring it back to life. I added a new beadboard backing and trim, lots of white paint. I patched the original knob holes and added some vintage pulls that I had from another project. I have had so much fun changing out the hutch for the seasons and holidays. Here we go! Here I am decking it out for the first time. I haven't even drilled the holes for the pulls yet. Notice I had an extra set of brass pulls and knobs(from Hobby Lobby), so I started to change them out depending on the color scheme. The inspiration for the blue and green was the Vera tea towel from my Mom. Green with a touch of blue for springtime. The first time I decorated it for fall. I love to add a cute tea towel to go with the theme. I added more aqua this last year. The first time I added blue to the red for the patriotic season. This is how it looks today for autumn. Here she was when I brought her home. This is the painted naked hutch waiting for some pretties. If you looked closely you might have noticed I also redid the kitchen chairs. They went from red to white. That way I can change them out for the season too. I like to decorate the hutch a little different each time, even though I use alot of the same stuff. I hope you enjoyed my little hutch history. I love being able to pull out my vintage dishes and thrift store finds to decorate her. Be sure and come back next week to check out the Fall in Love With Texas Blog Tour. It goes from Oct 3-7. I'll be showing my fall decor on Oct. 6. Hope to see you there! Hope you are enjoying your fall season. P.S. It finally cooled down today-gorgeous fall weather at last! Hi Leslie! 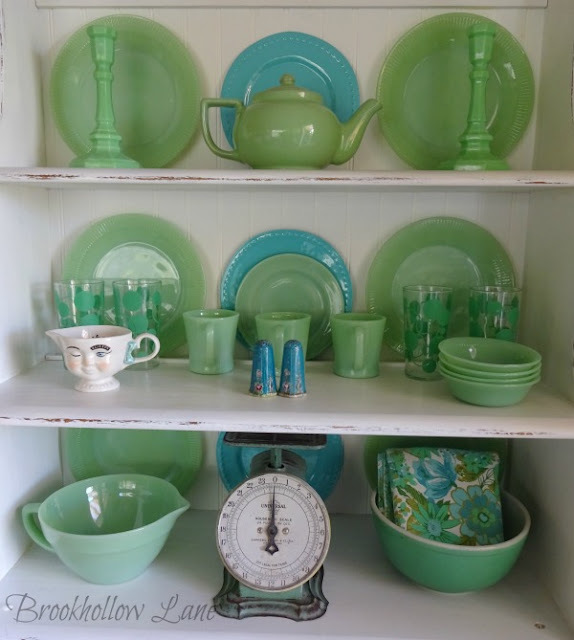 I so enjoyed seeing the transformation of your thrifted hutch and how you decorate it through the seasons. What fun for you to add all your special, seasonal items, to change the look. The pretty tea towels on the handle add such a cute look. 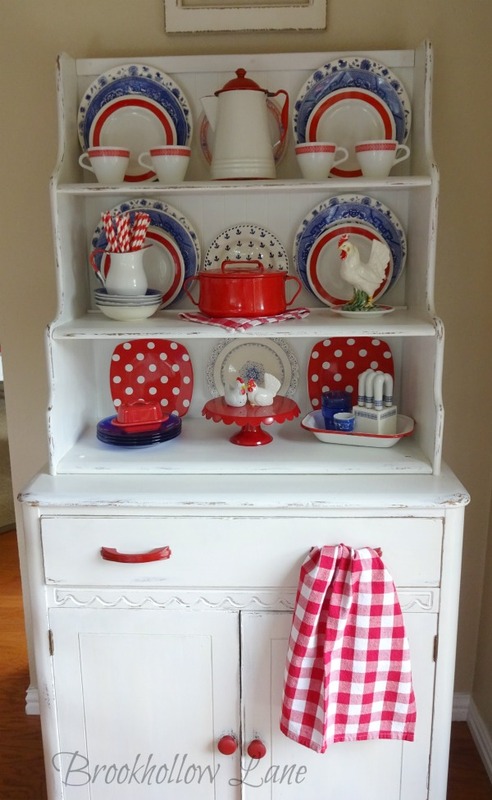 It makes me wish that I had room in my kitchen for a fun hutch to decorate! Hi Leslie, I loved seeing your hutch transformed from her beginning. It is such a great treasure and perfect in your kitchen. Painting it white was the answer to making it special. Love the way you change it out for the seasons. Beautiful vignettes each one and I know that it's so much fun to decorate. Thanks for sharing and inspiring. Yeahhhh for the cool down and rain!! Happy Fall. Thanks, Celeste. I am so glad I painted it white, because now it goes with everything. I always look forward to decorating it for the next season. Happy Fall to you too. Finally some nice weather! I absolutely love the seasonal hutch! I would love to be able to do this. I love visiting your hutch each season. You really do have fun decorating and creating such cute vignettes. Fun to have a piece like this that you can change up with the seasons and enjoy all your different dishes. I love all the different decorations of your hutch. You had a good intuition picking it up! I honestly would not have looked twice at that cupboard in an antique shop! It's so adorable painted white and you are a master at filling it with vintage seasonal decor. I can't wait to visit your autumn home tour, Leslie!